This is currently a 14-page chronology of UFO incidents and events for 1984. Our thanks for these chronologies must go to Richard Hall (the original 1984 chronology from UFOE II), Dan Wilson (archive researcher), and Jean Waskiewicz (online NICAP DBase [NSID]). You will note the many foreign reports that we are now being able to access. Our special thanks to Dan Wilson for getting those to us. As more come in, this page will be updated. Previous chronologies (1947 to 1969) involved the expertise of two other team members: William Wise (Project Blue Book Archive) and Brad Sparks (Comprehensive Catalog of Project Blue Book Unknowns). Bob Gribble's entries are those filed with the National UFO Reporting Center in Seattle, Washington, now operated by Peter Davenport. Numerous sightings, radar tracking (G,V), photographs by scientific field team with instruments (section VII). Aggressive dogs become uneasy in presence of red light. 4:14 AM. An ovoid UFO flew low over Lake Michigan and was sighted by three women in Port Washington, Wisconsin. The UFO had three portholes. (Source: Donald R. Schmitt, International UFO Reporter, March-April 1984, p. 3). 3:00 AM. EST. In the witness's bedroom a short humanoid pointed a beam at the witness in bed. The witness felt that the being could telepathically read her mind. When the being had left a three-foot long by 18" cylinder shot straight up into the sky outside. (Source: MUFON UFO Journal, August 1991). 3:15 AM. CST. On Interstate 80 three people driving in a van outside Cozad saw a 100-foot diameter disc hover 80 feet over the highway. It was blazingly brilliant and had more than 15 colored circular lights around the rim. They heard an intermittent beeping on the van's CB radio. (Source: International UFO Reporter, March 1984, p. 10). 9:30 PM. Mr. & Mrs. Sprinster had a close encounter with a multi-colored triangular shaped UFO 10 miles west of Torrington on Route 4. The object moved very slowly, and dropped in altitude to pace their car. Its underside was crisscrossed with tubes and grill work. A red light in the center of the object detached, circled the object three times, then returned back to its original position. It left by making a sharp turn to the south. The encounter lasted 10 minutes. (Source: Philip J. Imbrogno, Contact of the 5th Kind, p. 9). 9:33 PM. Two witnesses in a car driving north of Hawthorne saw two silent 75-foot in diameter parabolic discs 200 feet above SR 208. The objects seemed to be avoiding being seen by passing cars. (Source: Robert Gribble, MUFON UFO Journal, December 1983, p. 5). 10:30 PM. Several independent witnesses reported seeing a huge silent cigar shaped object over the highway on SR 14 15 miles north of Mojave, Kern County, California. It was only 100 feet over the road and had red lights on the bottom; it flew off to the north. (Source: Robert Gribble, MUFON UFO Journal, December 1984, p. 5). 7:25 AM. The cabin crew of United Airlines flight 729, flying westbound at 43,000 feet, observed a blurry bright red object about the size of a DC-9 airliner move from northeast to southwest. The object, which was in view for only a few seconds, left a contrail which the airliner passed through. 7:00 PM. Two occupants of a car observed a circular object with three brilliant white lights and a corona of white light covering its entire surface. As the object approached the car the driver made a 180 degree evasive turn only to have the object pull alongside and pace his vehicle. After about three minutes the object pulled away and left the area. The driver estimated that the object got to within 150 feet of the car, maintained an altitude of about 150 feet and was at least 25 feet in diameter. A vertical shaft of white light was also observed coming from the top of the object. After arriving home two witnesses observed three helicopters moving about in the area where the object was seen. 6:30 PM. An orange sphere was seen to land on a ridge. Two witnesses saw the UFO descend and land, while many others saw a bigger object rise from the same spot 20 minutes later. (Source: International UFO Reporter, March 1984, p. 7). 1:00 AM. Mr. Jonsson was driving home when he saw a disc-shaped object 80 meters across and some 5-10 meters above the road ahead of him. He got to his home, got his camera, and went back to the site of his encounter. His car stalled, and he recalled seeing several beings who attempted to abduct him. He had nearly two hours of missing time. An independent witness verified seeing the UFO. (Sources: Doris Graziano, APRO Bulletin, June 1985, p. 8; Thomas E. Bullard, UFO Abductions: The Measure of a Mystery, case 270). 4:00 AM. The witness awoke to a loud humming sound and found his room illuminated by a bright light. He got out of bed and went to the window and saw a bright white circular object with a hump on top in a stationary position about four feet above his neighbors yard. He estimated that the object was about 200 feet from him and the size of a small car. He saw an image like a man next to the object. The image vanished and the object ascended in a zigzag pattern, then moved away at a high rate of speed. The witness felt he observed the object for no more than ten seconds. He checked with the neighbors and they said they didn't see or hear anything. (Bob Gribble) (Source: Robert Gribble, International UFO Reporter, March-April 1984, p. 7). 3:30 PM. On the campus of Ohio State University in Columbus, Ohio witnesses observed a black sphere half a meter in diameter that hovered just over a University building, then shot off very fast toward the southeast. (Source: MUFON UFO Journal, May 1986). 9:00 PM. A man and his dog in Mechanicsburg witnessed a 40 foot wide diamond-shaped object wobbling in the southeast sky at an estimated 50 feet altitude. He also reported interference on his TV set. (Source: MUFON UFO Journal, April 1984). 10:00 PM. A large boomerang or U-shaped UFO was seen by two police officers, Jensen and Myers, west of Norris, South Dakota, after having been called out on a reported sighting of the UFO by a citizen ten minutes earlier. (Source: J. Allen Hynek, International UFO Reporter, March 1984, p. 6). A mother and daughter observed a large cylindrical-shaped UFO hovering outside their family room window in Wolcott, Connecticut. The object was just seven feet above the ground, and only four feet from the window. It made no sound, and stayed there for seven minutes. (Source: Robert Gribble, APRO Bulletin, June 1984, p. 5). 7:45 PM. A truck driver driving on Interstate highway I-87 south of Albany saw a delta-shaped UFO that looked larger than a Boeing 747. It paced his truck for five minutes. He reported it had "prism-ish" lights. (Source: J. Allen Hynek, Philip J. Imbrogno & Bob Pratt, Night Seige: The Hudson Valley UFO Sightings, p. 63). 8:00 PM. Three 12-meter long boomerang-shaped objects hovered at low altitude over a highway in Claxton. One of the object flew directly overhead at treetop level. It had lights all over it. (Source: Michael Hitt, Georgia UFO Phenomenon 1947-1987, p. 81). A rectangular UFO hovered only 100 feet above the side of a road near the RAF Lakenheath Air Base in England. It had red, green and white lights, and was silent. (Source: International UFO Reporter, March 1986, p. 5). 8:05 PM. Five people in Llano, Texas, witnessed a huge dome-shaped UFO fly over their house at only 200 feet altitude. It made a loud humming noise and had lights on the rim. A jet aircraft was seen in pursuit of the UFO. (Source: International UFO Reporter, May-June 1984, p. 16). 16.00 GMT. Air traffic controllers at an eastern airport in England witnessed a glowing sphere that looked like "masses of silver paper crinkled up" touch down on a cross runway, then rocket skyward in a maneuver they judged impossible for aircraft. It climbed 3000 feet in under a second. (Source: International UFO Reporter, March-April 1986, p. 5). 7:10 PM. Radar visual confirmation. A 1000 foot long cigar-shaped object followed a KC-135 USAF tanker aircraft through a U-turn over the mountains of Chimayo, New Mexico while separate nocturnal lights cavorted about in the sky. Radar blips were tracked at the time. (Source: MUFON UFO Journal, November 1984). 5:30 PM. A silver colored, 150 foot long, bulbous-shaped object with a long tail hung in the sky, rocking back and forth 80 feet above the ground over a garden in Blairgowrie, The Orkney Islands, Scotland. Mrs. Freeman's dog cowered, and she was temporarily blinded by a ball of light from the object that struck her and entered her body, and she felt the warmth emitted by it but at the same time felt a sensation of calm. A beam of light flowed upward from the object. After a few minutes the object vanished in a pink flash. (Sources: Ron Halliday, UFO Scotland: The Secret History of Scotland's UFO Phenomenon, p. 125; Jenny Randles, International UFO Reporter, March 1986, p. 7). 9:55 PM. Structural details of a UFO were observed by three witnesses in a car as the UFO passed over them at 100 feet while they were driving down American Canyon Road in Napa, California. The UFO was first seen at 9:55 p.m., and described as delta shaped and over 300 feet wide. It flew away up the canyon, and was in sight for five minutes. (Sources: Robert Gribble, International UFO Reporter, May 1984, p. 16; MUFON UFO Journal, May 1984). 11:00 AM. A humanoid wearing an odd helmet was seen in the woods west of Macomer, Sardinia, Italy by two children. There was an odd silence that permeated the encounter, which lasted only a couple of minutes. A disc-shaped object rose from the forest floor, then flew off to the east-northeast. (Source: Larry Hatch, U computer database, case 14138, citing CISU). At 1400 hours GMT a ultra-sensitive orbiting US DSP (Defense Support Program) spy satellite detected the entry of an unknown object that passes 15 miles in front of it, and then flew below it over the Indian Ocean. An alert was triggered at the North America Air Defense Command. Object moving at 22,000 miles per hour., changed course, and flew back out into outer space. (Source: Michael D. Hall, UFOs: A Century of Sightings, p. 324). Time not given. A 13-year-old boy working at a kennel in Williston, Florida heard a humming noise, and noticed that the dogs were attempting to hide in their pens and whining. As he went out to investigate the area turned red with illumination, and a bright red disc-shaped object hovered only 20 feet over his head. He felt heat coming from the object. When he returned to the dog pens, the dogs barked at him and would not let him inside. (Sources: Robert Gribble, International UFO Reporter, May 1984, p. 16; MUFON UFO Journal, May 1984, p. 11). 8:15 PM. A V-Shaped formation of 15 lights, estimated to be the size of a Boeing 747 airliner if all connected to one object, passed directly over the home of an IBM engineer in Hawthorne, Westchester County, New York It made no sound as it passed overhead except a faint humming. All lights simultaneously turned blue, and then made a tight 180-degree turn and flew off to the north. (Source: Philip Imbrogno, International UFO Reporter, September 1984, p. 5-7). 8:30 PM. A V-shaped object was seen from Route 117 in Pleasantville, New York. It was reported to be larger than a football field, and it followed a car being driven on the Taconic Parkway. (Source: Philip Imbrogno, International UFO Reporter, September 1984, p. 5-7). 8:45 PM A V-shaped formation of lights were seen by Mr. D. Boyd in Yorktown, New York. An engineer and private pilot, he watched them turn and fly away toward the west. 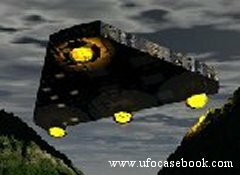 V-shaped or triangular UFOs were also sighted later that night in Fishkill and south Putnam County. (Source: Philip Imbrogno, International UFO Reporter, September 1984, p. 5-7). A very luminous object shone a bright light into the window of a mobile home in Staunton, Virginia. The UFO was football-shaped, about the size of a car, and made a faint buzzing noise. (Source: APRO Bulletin, February 1985, p. 7). UFO investigators went to a Jewish cemetery in the UFO hotspot of Pine Bush, New York. A close encounter with a landed, delta-shaped UFO scared them away. (Source: Ellen Crystal, The Silent Invasion, p. 73). 10:30 PM. Guards at the Indian Point nuclear power plant on the Hudson River, New York sighted a dark disc-shaped object with lights, 30 feet in diameter, that stayed over the nuclear reactor for 15 minutes. It finally flew away toward the northeast. (Source: J. Allen Hynek & Philip Imbrogno, Night Siege, p. 143). A bright circle trailing a red tail and flashing a beam of light from its circumference was seen hovering over Blairgowrie in the Orkney Islands, Scotland. A V-shaped object was seen to leave and return to the circular object several times. After awhile both objects faded away. (Source: Ron Halliday, UFO Scotland: The secret history of Scotland's UFO phenomenon, p. 141). 9:38 PM. A disc with an orange halo hovered over a park in Cape Girardeau, Missouri at an estimated altitude of 1,000 feet. It winked out after fifteen seconds. (Source: APRO Bulletin, February 1985, p. 8). On this night hundreds of witnesses in the Hudson Valley, Westchester County, New York saw a number of small round lights which hovered, made abrupt right angle turns, disappeared and reappeared. The objects changed colors, made a faint humming sound, and moved from one shaped-formation to another. (Sources: Richard F. Haines, Project Delta: A Study of Multiple UFO, p. 71; Peter Brookesmith, UFO: The Complete Sightings, p. 128; Discover, November 1984). 9:05 PM. Carol Cloukey and Robert White had been on their way to Pittsfield, Maine for dinner. After traveling about a mile they rounded a bend and Carol, who was driving, was the first to see a bright yellowish-orange light. Suddenly the light made a perfect vertical drop in mid-air. They sped up to get ahead of the object, but the light dropped lower again, and was now dead center above the car windshield. Carol stopped and slammed the car into reverse. After backing up about 50 feet they saw that the object was alongside of them on the left side of the car and about 150 off the ground. The glow had subsided, and in the evening twilight it appeared grayish in color, triangular shaped, and larger than a 747 aircraft. It had 4 red lights and 1 or 2 brighter white lights. It made no sound. Robert opened his door to see if it was possible to make a 180-degree turn, and he told her to back into the driveway of a farmhouse. The object was now almost directly above them at an approximate altitude of 100 feet. He observed that when they stopped the UFO stopped, and when they moved the UFO moved! It became apparent that "it" did not want to let them go. Robert got out of the car and started to run toward the farmhouse. Carol called to him that another car was coming down the road. The UFO now began to move away slightly, traveling in a northeasterly direction for a distance of a few hundred feet when it suddenly vanished right before their eyes. Robert later expressed wonderment that such a large object could suddenly disappear in such an inexplicable manner. They estimated that the total incident took about two minutes to transpire. (Source: Leland Bechtel, MUFON UFO Journal, October 1984, pp. 14-15). 8:20 PM. A huge boomerang-shaped object with lights running along its leading edge was seen flying over Pound Ridge. (Source: J. Allen Hynek, Philip Imbrogno & Bob Pratt, Night Siege: The Hudson Valley UFO Sightings, p. 106). 9:00 PM. A very large boomerang-shaped UFO hovered only 300 feet over an active vent of the Indian Point Nuclear Plant cooling tower for 15 minutes on the Hudson River in Westchester County, New York. Several guards came forward to report the incident, reporting there were a total of eleven witnesses to the UFO at the plant that night, and that the security guards broke out shotguns. A big cover-up by government officials was claimed. (Sources: Doris Graziano, APRO Bulletin, June 1985, p. 8; Larry Hatch, U computer database, case 14168, citing George C. Andrews, Extra-Terrestrials Among Us, p. 302; J. Allen Hynek & Philip J. Imbrogno, Night Seige: The Hudson Valley UFO Sightings, p. 148; Dennis Stacy, Field Guide to UFOs, p. 120; Peter Brookesmith, UFO: The Complete Sightings, p. 128). 10:20 PM. A videotape was made by a Mr. Pozzouli of a ring of lights in the dark sky over Brewster, New York in the Hudson River Valley, suggesting a dark circular, ellipsoid, or disc-shaped object. Analysis of the videotape was done by Dr. Lew Allen of the Jet Propulsion Laboratory. (Sources: J. Allen Hynek & Philip J. Imbrogno, Night Seige: The Hudson Valley UFO Sightings, p. 128; Philip J. Imbrogno, Contact of the 5th Kind, p. 2). At 3:45 a.m. a spark-tailed fireball splashed down 1000 yards south of Lummi Island in Washington State. The impact sent a plume of water 100 feet into the air before the object sank and the water as the surface of the sea rolled and bubbled. (Source: Doris Graziano, APRO Bulletin, February 1985, p. 8). 9:05 PM. Pulsating orange object sighted by MUFON SSD Ridge's 8-year-old daughter. Object was in the north heading east at low level for approximately 10 minutes. This NL was logged as an OBOL (Orange Ball Of Light) and witnessed by the SSD and his son, Brian (15), who observed the object from the roof of their home north of town. 8:00 PM. A large disc-shaped UFO followed a Piper airplane from Cordoba to Resistensia, Argentina. It reportedly maneuvered at great speed, and changed color from silver to orange. The plane's compass oscillated between 0.5 and 270 degrees, and there were several other variations noted in other onboard instruments. (Source: Dominique Weinstein, Aircraft UFO Encounters, p. 51). Astronomer and UFO expert J. Allen Hynek, accompanied by field investigators Philip Imbrogno and Dennis, saw a "Ferris wheel" shaped UFO in the sky in Hudson Valley, New York that turned on its side and then disappeared. (Source: J. Allen Hynek, Philip J. Imbrogno & Bob Pratt, Night Seige: The Hudson Valley UFO Sightings, p. 151). 8:30 PM. A disc-shaped object with an amber light on the bottom and red lights in a circle on top of the disc buzzed a witness driving in a car north of Tyrone, Pennsylvania. (Source: APRO Bulletin, January 1986, p. 8). 8:45 PM. Abduction near Mt. Vernon, IN. Two percipients, several hours. (Ridge files). 6:15 PM. A UFO seen by Mr. & Mrs. Hoel in Gloucester, Massachusetts seemed to respond to their comments while flying over Magnolia Bay. The dark triangular object, 150 feet wide, with a canopy underneath, flew at 125 feet altitude and passed over Magnolia Bay and surrounding trees. It made a low droning sound, and seemed to be made of a non-reflective material. (Sources: Doris Graziano, APRO Bulletin, June 1985, p. 8, citing the Gloucester Times; John Melesciuc, MUFON UFO Journal, February 1986, p. 11). 10:00 PM. A 30 foot long X-shaped object paced a car for 20 minutes along a highway in Martinsburg, West Virginia. There were five lights on the bottom of the craft and it made a humming noise. (Source: Robert Gribble, National UFO Reporting Center, case number 1147). 6:10 PM. In Level Green, Pennsylvania in the UFO hotspot of Westmoreland County, two residents of the community heard a tapping sound on one of their house windows. They saw what looked like an eye-like orb peering in through the window. It turn and flew away, but repeated the performance one more time. (Source: MUFON UFO Journal, June 1985).